Hart & Soul have a wholesome burger for you! Burgers can be a complete dish, easy to make at home and could even be “balanced” if we choose the right bread, reduce the tonne of mayonnaise and five kilograms of French fries. Our vegetarian burger ticks all the boxes; shape, texture and taste. 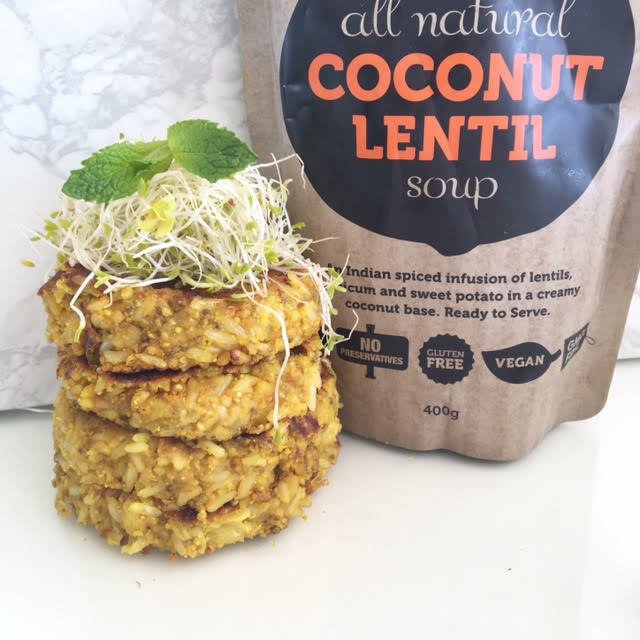 The talented Elle from Cheeky Coconuts has developed a tasty vegan burger recipe using our Coconut & Lentil soup. And don’t worry, this recipe won’t keep you in the kitchen for hours! It’s easy, quick and D.E.L.I.C.I.O.U.S. You can also make a whole batch of these delicious vegan steaks, place them in separate resealable bags and store them in the freezer. When you feel like eating a ‘vegan steak’, just take one out, cook it and voilà. Mix the soup and the chia seeds in a mixing bowl and allow to stand for 10 minutes. Add the remaining ingredients (brown rice, almond meal) and stir to incorporate to the mix. Shape into four even patties and lightly fry in a pan until golden brown.